The Netherlands: The Queen has abdicated, long live the King! Queen Beatrix of the Netherlands (now Princess Beatrix) signed the abdication document earlier today, 30 April 2013, and was immediately succeeded by her eldest son, King Willem-Alexander. The investiture ceremony, in which the new king took his oath, took place at 2 p.m. More information on the abdication and investuture can be found at the official website. No. 1-3 are daughters of the king, then follows his youngest brother Prince Constantijn and his children and finally the king's aunt Princess Margriet. I had meant to cover the abdication and investiture in more detail, but as I have caught a severe cold as well as a mere touch of influenza, I have had to restrict myself... Normally I would have written about yesterday's events in Serbia, when the remains of Queen Maria of Yugoslavia were repatriated to Belgrade, as well, but this will have to do. The state funeral of King Peter II, Queen Alexandra and Queen Maria is to take place on 26 May 2013. The Grand-Ducal Court of Luxembourg announced on Monday 22 April 2013 that "the wedding of His Royal Highness Prince Felix of Luxembourg and Miss Claire Lademacher will be celebrated on Saturday 21st September 2013 at the Sainte Marie-Madeleine de Saint-Maximin-la-Sainte-Baume basilica in France. The civil wedding will take place on 17th September at Königstein im Taunus in Germany." The couple's engagement was announced on 13 December 2012. Ms. Lademacher is currently living in Rome, Italy, where she, according to the CV provided by the court, is working on her PhD on the ethical aspects of organ donation consent. Many had speculated that the wedding would take place in Germany where Prince Felix' fiancée comes from, and were of course right, as the civil wedding is the only valid one according to the authorities, while some might have been surprised that the religious celebration and main event will take place in Saint-Maximin-la-Sainte-Baume in the Var departement in Southeastern France. Some have also found it somewhat surprising that Prince Felix, who is second in the line of succession to the throne, is not getting married in Luxembourg. I have no opinion on the matter, but as it has been pointed out, it has not been so unusual for princes of Luxembourg to marry outside the grand-duchy. Grand Duke Henri's younger brother Prince Guillaume married in Versailles, France, while Grand Duke Jean's brother Prince Charles married in Guilford in Surrey, England. See also the blog Luzarazzi concerning the announcement and the five bishops having official roles at the religious celebration as well as the local newspaper Wort.lu. 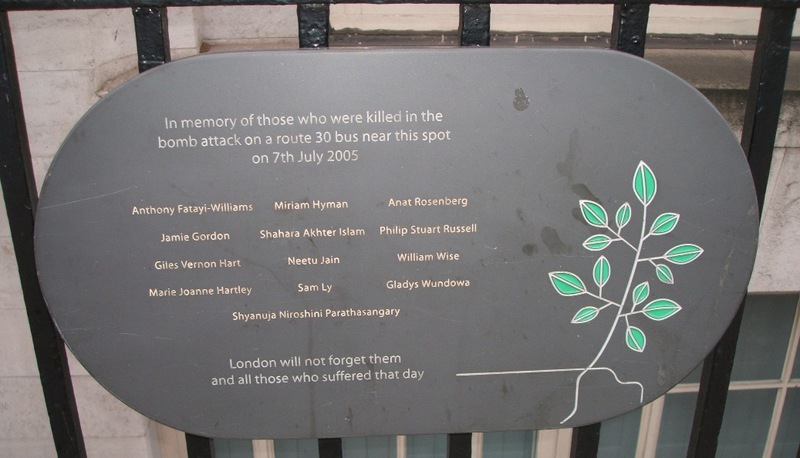 "In memory of those who were killed in the bomb attack on a route 30 bus near this spot on 7th July 2005". 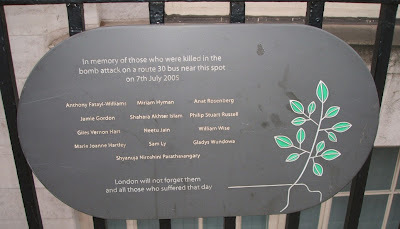 "London will never forget them and all those who suffered that day"
The annual report of the Norwegian Royal Court for 2012 was submitted to the Presidium of the Storting, the Ministry of Government Administration, Reform and Church Affairs, and the Office of the Auditor General of Norway, on Friday 5 April 2013. I left for England that day and have since not had much time to comment on it, but even if the news is now somewhat old, it is worth commenting on. 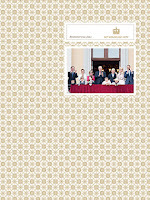 The annual report provides an overview of the official programme carried out by the Royal Family and presents the Royal Court and its activities. It also contains the accounts for the Civil List, the staff of Their Royal Highnesses The Crown Prince and Crown Princess, and the Cultural outreach activities. During 2012, His Majesty The King attended 225 official events in Norway and abroad, while Her Majesty The Queen attended 102 official events, His Royal Highness The Crown Prince attended 161 official events and Her Royal Highness The Crown Princess attended 90 official events. 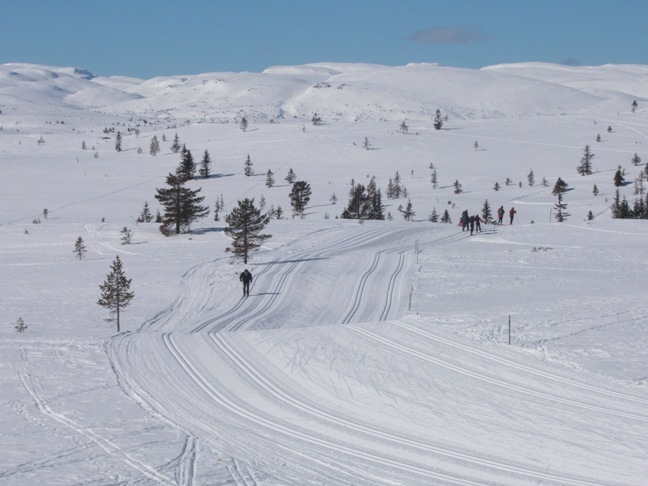 The Royal Family visited 53 municipalities in 17 counties and Svalbard in Norway, and paid several visits abroad. The King and Queen carried out their annual county visit in Vestfold county in June, while the Crown Prince and Crown Princess visited Møre og Romsdal county in May. The King and Queen conducted a State Visit to Poland in May, while the Crown Prince and Crown Princess travelled to Indonesia for a State Visit in April. A report on the use of the funds allocated to the Royal Court (the Civil List) and the staff of the Crown Prince and Crown Princess (official budget) by the Storting is submitted annually. The allowances provided to the King and Queen and to the Crown Prince and Crown Princess, respectively, are meant to cover the management, operation, maintenance and development of the private properties, as well as official attire and private expenses. The accounts for the Civil List showed a deficit of NOK 3 699 858. 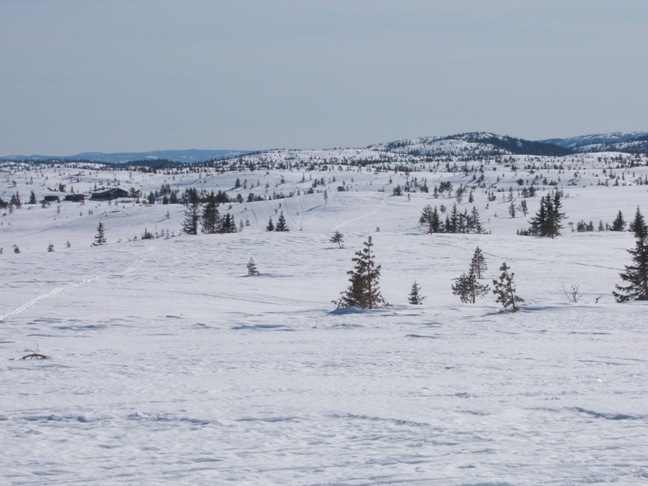 This is a planned deficit that will be covered by appropriations from the surplus in 2011, NOK 1 286 853 from appropriations to special projects, and NOK 2 413 005 from ordinary appropriations. The accounts for the staff of the Crown Prince and Crown Princess showed a deficit of NOK 466 072. This is a planned deficit and will be covered by appropriations from previous years. The accounts for "Åpent Slott" (Cultural outreach activities) showed a deficit of NOK 44 162. This deficit is carried forward in its entirety. The Civil List will supply the Section for Culture with adequate liquidity for its future operations. The annual report also contained a survey of the orders and medals awarded by the king. 27 persons received the Royal Norwegian Order of St. Olav in 2012, compared to 30 in 2011 (all classes combined). 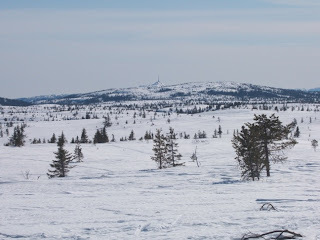 Among those were the President of Finland, Sauli Väinämö Niinistö, and the former private secretary to the king, Berit Tversland (Grand Cross), Fylkesmann (Governor) Hans Johan Røsjorde (Commander) and the members of the former pop group Aha, Morten Harket, Paal Waaktaar-Savoy and Magne Furuholmen (Knight First Class). 105 persons received the Order of Merit (all classes combined), among them Poland's Prime Minister Donald Tusk (Grand Cross). The Medal of St. Olav was given to 3 persons, while there were 174 recipients of the King's Medal of Merit (down from 348 inn 2011). Finally 16 persons received the King's commemorative medal, including slottsknekt (palace receptionist/gatekeeper) Vidar Aamodt. Check out the Royal Court's website for more information on the Norwegian orders and medals. The annual report 2012 can be downloaded here. For earlier annual reports, go here. 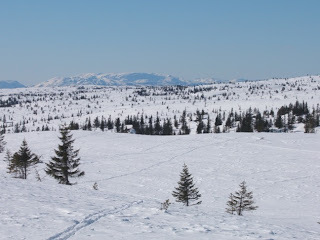 See also my earlier blog articles The Norwegian Royal Court. Annual report 2011 (published 11 April 2012) and 2010 (published 12 April 2011). 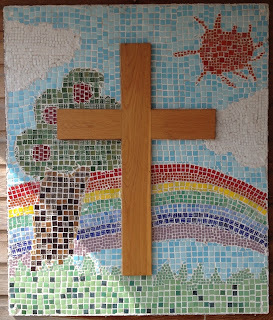 On Saturday 6-7 April I attended for the second time the traditional Royalty Weekend conference, which took place at Ticehurst and Flimwell Church of England Primary School, Steellands Rise, Ticehurst in East Sussex, England. Just like in 2011, I write a few words about my impressions from the conference as well as from the other events during my stay in England. 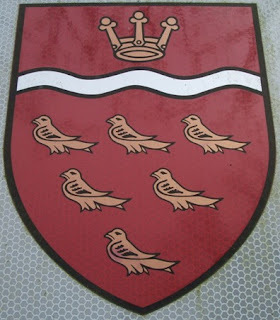 The arms of the parish of Ticehurst (but not of the family carrying the same name). This time I had opted for the B&B situated closest to the school, The Cherry Three Inn, which was as nice as the name suggested. The room I rented was nice (with free wifi!) and the food at the pub was excellent. For lunch I enjoyed a traditional English treat - lamb liver and bacon! Delicious! The pub owners, Michael and Joanne Hehir, made me feel more than welcome. Definitely in the country side! 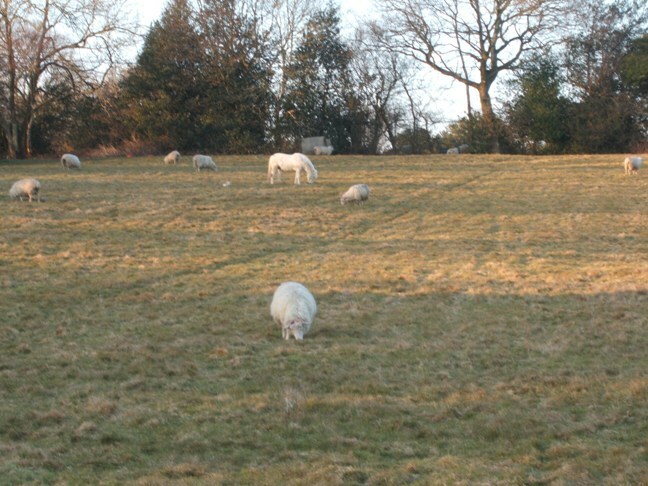 Horses and sheep eating outside the Cherry Tree Inn. 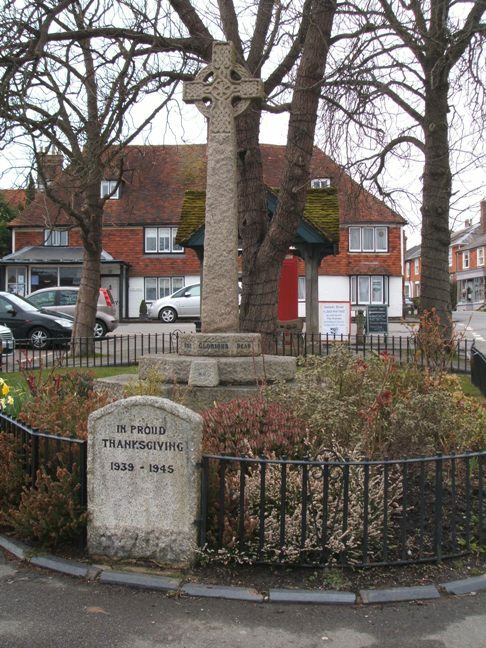 The war memorial in High Street. Did I get a better picture this time than in 2011? 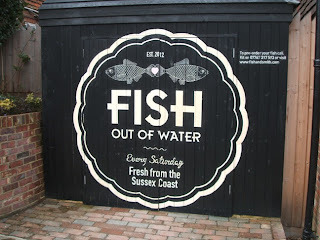 After the lunch I went for a walk in the little village of Ticehurst. In 2011, I didn't get to see the local church, St. Mary's, from the inside, so I had to make sure to explore it this time. A separate article will be published later. 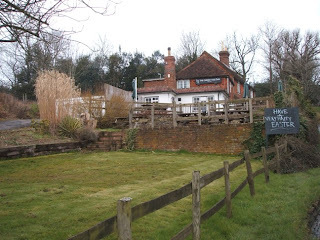 In the evening I joined several Royalty Weekend attendees for dinner at The Bull at Three Leg Cross. I attend the conference to get new input and get inspiration for all my royalty-related activities on among others my website and blog, but the social aspect of the «royalty-watchers'/historians' gathering» is nearly as important. It is really nice to meet old and new friends who share the interest in royal history and genealogy with me. So many knowledgeable people at the same place! 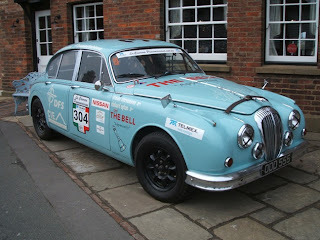 Outside The Bell, High Street. 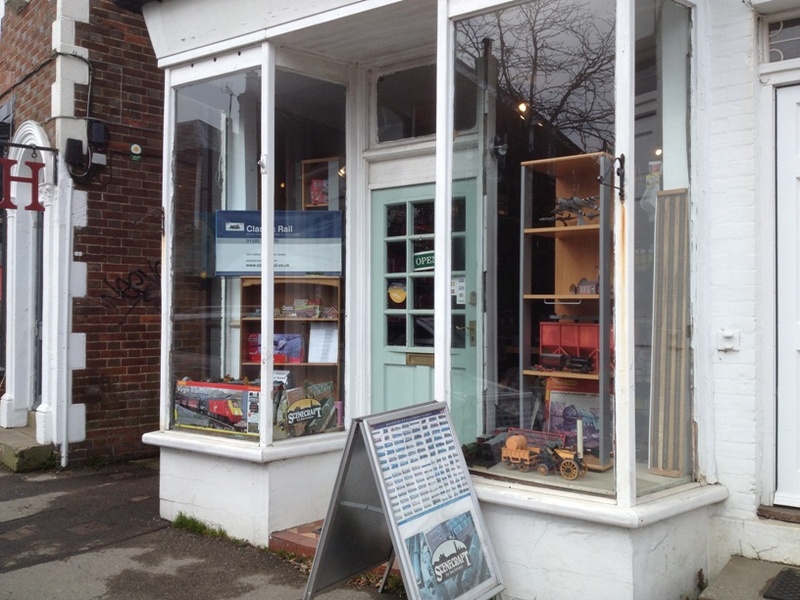 Would you belive it - Ticehurst, a mecca for train lovers! 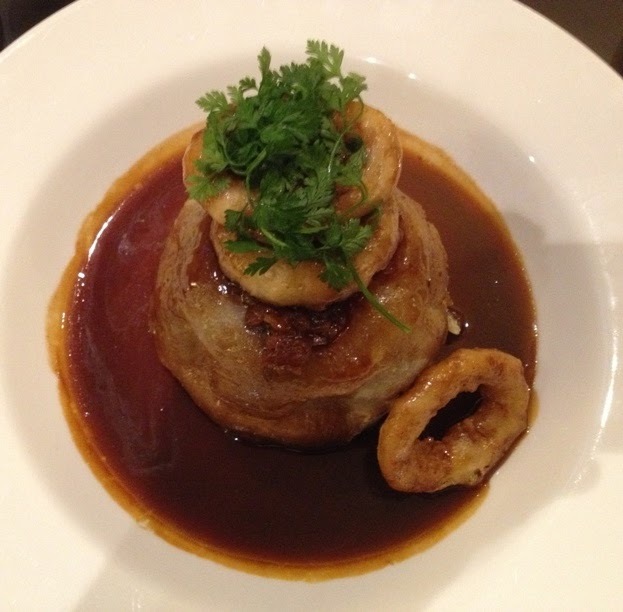 The food is of course also important, and The Bull certainly didn't disappoint. I never figured out what the soup of the day was made of, though - it was very green, but didn't taste so much spinach as one could have expected. I liked it, anyway! The chicken, ham and leek pie for the main course was great, and the vanilla cheesecake was heavy stuff. I might go for «sausages and mash» and «fruit crumble» next time around. 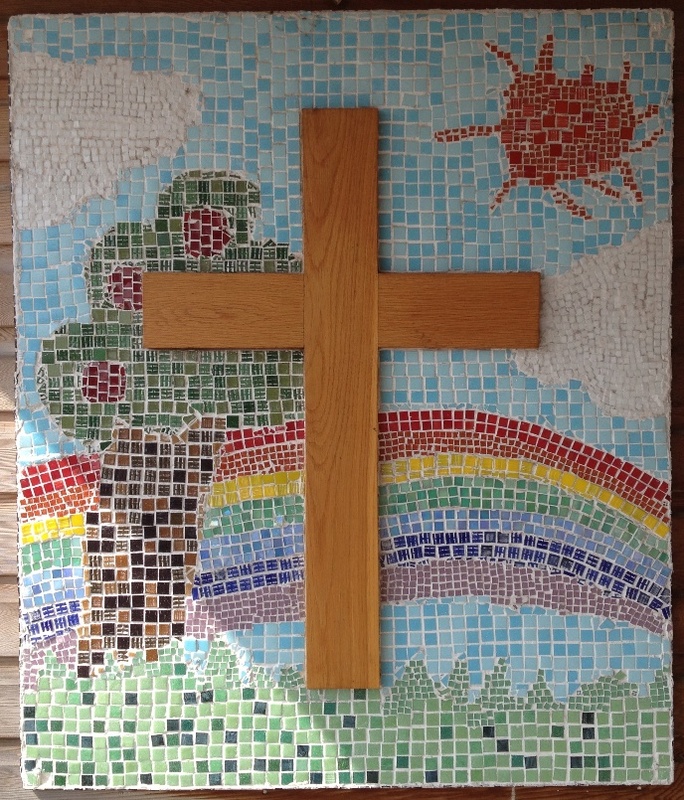 At the main door of Ticehurst and Flimwell Church of England Primary School. 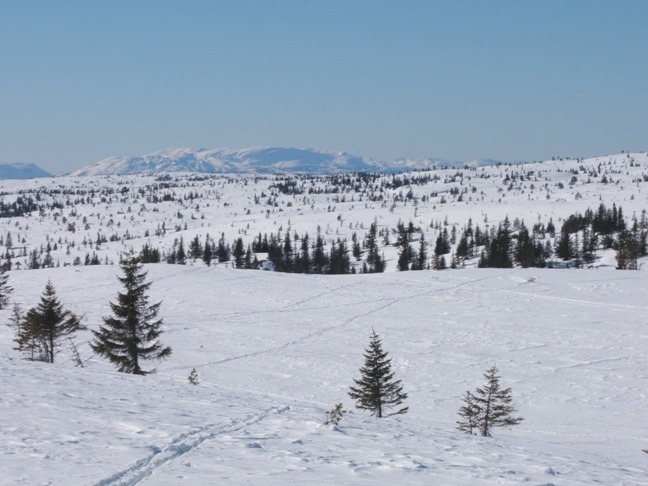 When I attended the conference two years ago, we were treated by great spring weather with temperatures close to 20 Celsius degrees. 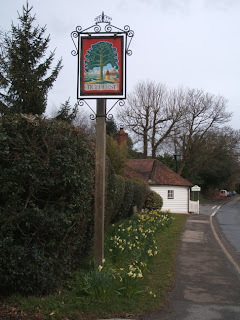 When I arrived at Wadhurst railway station on Friday 5 April, sleet was in the air, and even if the weather got a little bit better during the weekend, it was still really cold. It was equally cold inside the school where the conference took place, but at least the hall where the talks and meals took place was endurable. The editor of Royalty Digest Quarterly, Ted Rosvall, left, and the editor of The European Royal History Journal, Arturo E. Beéche, right, share the same market and had lots to talk about during the weekend. Now back to being positive again: After the conference was opened by the compère, Revd. Richard Thornton, Ted Rosvall, the Bernadotte genealogist, founder of Rosvall Royal Books and editor of Royalty Digest Quarterly, gave the first lecture, this time with the topic The lesser-known and hidden-away royals. His run-through took us from the Bernadottes to Luxembourg (and Nassau), Prussia, Bavaria, the Netherlands, the United Kingdom, Montenegro, Serbia and Greece. Not all the royals were that «lesser known», at least to me, but it was a nice talk anyway, and with many great slights to watch. Towards the end of his talk Rosvall also mentioned that Queen Olga of the Hellenes' photo album was to be published soon with Prince Michael of Greece as the editor as well as the royalty portrait collection Personalities. Royalty and Celebrity in the 1870s by Harold Brown. The writer and RDQ historical consultant Charlotte Zeepvat was the next one out with a great outline of the history of the House of Nassau through photographs, and what a fantastic subject title: «I didn't know they had royalty in Bahamas»! Yes, someone had actually said that! After lunch, Revd. Richard Thornton challenged the audience with his «fiendish quiz». And «fiendish» it was indeed. Now, I like to think of myself as having knowledge of royalty above the average, but I soon realized that I belonged to the minor league among the many knowledgeable people in attendance! I didn't even bother to deliver the answer sheet afterwards! 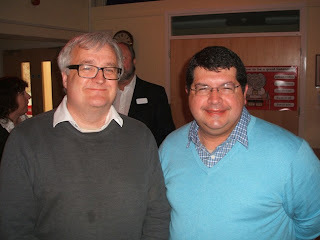 Ted Rosvall won the quiz as he said he would, with 27 1/2 of 40 points. Many people thought the quiz was too difficult, and it is still an open question whether the exercise will be repeated next year or not. But maybe if it was organised differently - in groups, perhaps - it could be better received? After the quiz, Robert Golden, author of Relatively Royal (2000), The Golden Book of Royalty (2002) and Definitely Royal (2012) and a regular contributor to the magazine Majesty, held a talk themed The wider Royal Family: some of those I have known. My goodness what an impressive network he has! And so entertaining his presentation was! The lucky Golden is to attend the state funeral of King Peter II, Queen Alexandra and Queen Maria of Yugoslavia in May 2013, by the way. Ian Shapiro, formerly with Argyll Etkin, now with his own business dealing with royal and historical memorabilia, was the last one out on Saturday with his talk about The hidden archive of Princess Irene of Prussia. The princess in question was Princess of Irene, née Hesse and by Rhine, a granddaughter of Queen Victoria of the United Kingdom and a sister of among others Princess Alix (Empress Alexandra Feodorovna of Russia) and Princess Elisabeth (married to Grand Prince Serge). The collection which Shapiro gave examples from, contains birthday and Christmas greetings - often illustrated by royals themselves - photos, telegrams, funeral programs, paper cuttings etc. In the evening the group returned for yet another great dinner and nice talks. Helen Rappaport opened the Sunday session with an update on her forthcoming book Four sisters, which deals with the daughters of Emperor Nicholas II and Empress Alexandra, and which is due in the spring of 2014. The King Zog/Albanian Royal Family expert Neil Rees given several talks about the Zogu dynasty over the years, and this time he gave the story of the reburial of King Zog in Albania in 2012. I am happy (if one is allowed to use such a word about a cemetery visit) that I managed to visit King Zog's grave in Paris before his remains were moved to his homeland. I would very much like to visit the royal mausoleum one day. The key to the entrance can be received from the neighbour restaurant, I was told! Rees' book A Royal Exile: King Zog and Queen Geraldine of Albania (2010) is to be revised. His next project goes in a different direction, however, as he is to explore King Louis XVIII of France's exile at Hartwell House. The around 75 people - some generalists, some experts on the Romanovs, the Zogus, the British Royal Family and others - will of course have their own impressions and favourites. I hope all the speakers take it the right way when I say that to me the highlight of the Royalty Weekend was Margreeth Pop-Jansen's presentation of A Remarkable Princess: Marianne of the Netherlands. What an interesting character the princess was! There are many ways to tell stories about the royal families. One way goes through royal jewellery. Certainly not my field, but Christophe Vachaudez' presentation in words and pictures about Belgian royal jewels was well worth listening to and watching. His next book project is on the Luxembourg royal jewellery collection. The foundation-owned collection, it should be added, not the private one. The last one out in this year's Royalty Weekend was Coryne Hall, whose latest book is Hvidøre: a Royal Retreat (2012). She is currently working on a book about royal women in nursing (Princess on the Wards. Links Between Royal Women and Nursing), which is to be published in 2014. She gave several examples in her presentation, including Princess Alice of Greece, mother of Prince Philip, Duke of Edinburgh, Princess Margarita of Baden and Princess Eleonore of Reuss-Köstritz, later Queen of the Bulgarians. Hall also showed the image of a stamp showing Archduchess Marie-Astrid of Austria, née Princess of Luxembourg, from 1970 President of Luxembourg's Red Cross youth organisation and a trained nurse as well. I would love to get hold of that stamp one day. All in all I enjoyed the Royalty Weekend very much - even if some topics interested me more than others, I never had a boring moment. Some speakers used less time than expected, which gave more time for socializing and purchasing books, but perhaps one or two more topics - they didn't have to be that long - could have been pressed in? Anyway, thanks to Sue Woolmans for once again being the main responsible for putting it all together, and to Richard Thornton and the others who helped out. 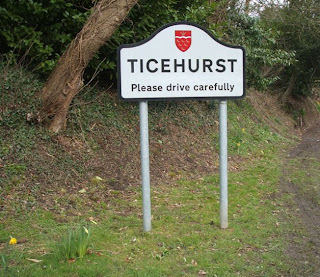 Currently there is a discussion at the Royalty Weekend's Facebook page whether the conference should be moved to another location more easily reachable than Ticehurst. I can understand the wish, as another venue might attract more people than the core group of royal fans, but at the same time I find Ticehurst to be a charming place. It is also a matter of keeping the costs down, and someone has to organise it all. People like Woolmans and Thornton - and before them Paul Minet & Co. of the bookstore in Ticehurst - are few and far between. In other words, I find it difficult to make up my mind about what I actually prefer. First of all I hope the conference will continue in the years to come! As I have already mentioned, about 75 people attended the Royalty Weekend. It still amazes me that so many people from the great republic of the United States of America travel so far for this kind of conference! There were also people from Australia, the Netherlands, Belgium, Sweden, Denmark and Norway besides the many Britons. Have I forgotten any other nationalities? Concerning the book sale, I didn't buy more than one during the weekend. There were several interesting titles, but I don't have much space at home for too many new books. I have to find a bigger place to live first. The last 2-3 years most purchases have been Kindle versions. Normally I prefer text books rather than photo books, but I actually ended up with Jean Louis Schlim's Prinzregent Luitpold. Erinnerungen aus königlichen Photo-Alben (August Dreesbach Verlag, Munich, 2012). The book had some useful genealogical tables as well. I considered to buy the photo book The Princely Family of Liechtenstein by Uve Harder (Van Eck Verlag, 2013) as well, but postponed it. 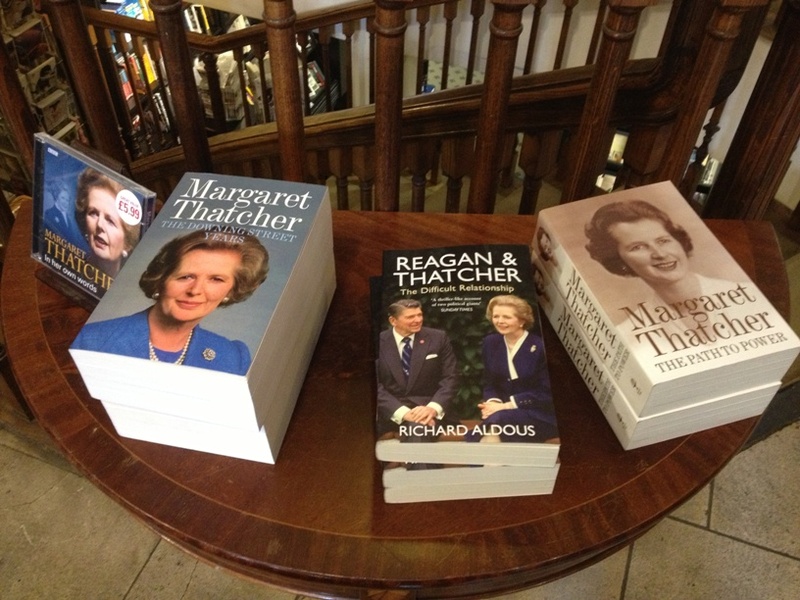 I might drop by the van Hoogstraten bookstore in the Hague when I visit the Netherlands in September this year. For some of us the social gathering continued on the train back to London and in a Chinese restaurant in the Soho area in the evening. I had decided to spend a couple of days in London before returning to Norway, so on Monday 8 April I decided to visit the St. Mary's Catholic Cemetery and Kensal Green Cemetery to take photographs of the royal graves there. I will return with separate blog articles about these visits later on. 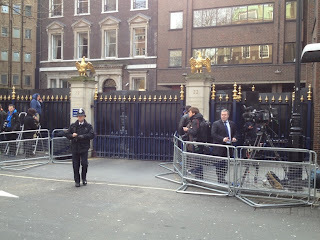 Upon my return to central London, I was reunited with two Royalty Weekend attendees for lunch at a pub near The Ritz. 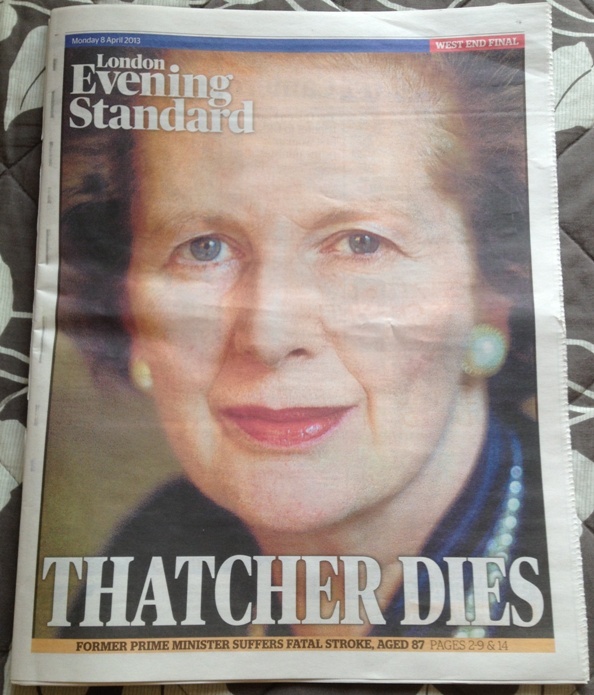 During our burger meal the news of former prime minister Baroness Thatcher's death reached us, and we hurried down to the gate in Arlington Street to see what was going on. Not much, I have to say, but an impressive number of photographers and reporters had assembled to wait for the undertakers to bring the former prime minister's body out of the hotel. No-one had the slightest idea of when this move could take place (it didn't happen until the next morning! ), so we did a detour to 10 Downing Street. Not much happened there either, so when I was on my own again, I returned to Arlington Street, with a break at Hatchard's bookshop. 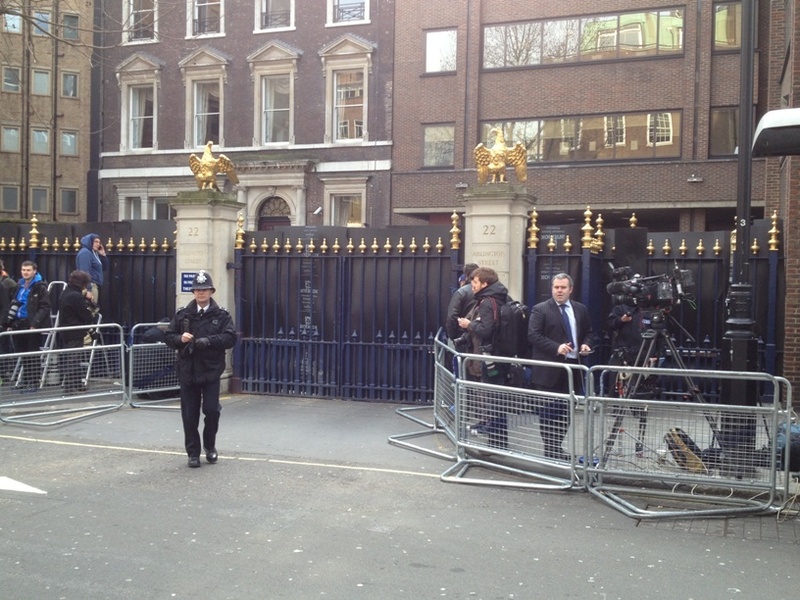 Outside 22 Arlington Street, where Baroness Thatcher died on Monday 8 April 2013. Hatchard's at Piccadilly was in the middle of a reorganisation process and looked rather chaotic, I must say. The royal books section had become even smaller since my last visit, and had been moved across the room, while the other biographies had been moved to the basement. No more space for book purchases, you say? I ended up with buying Pamela Hick's autobiography Daughter of Empire. Life as a Mountbatten (Weidenfeld & Nicholson, London, 2012), Helen Rappaport's Magnificent Obsession (Windmill Books, 2012, paperback edition) and Peter Conradi's The Great Survivors. How monarchy made it into the twenty-first century (Alma Books, updated paperback edition, 2013). I was interviewed by the author for the book a few years ago, but had forgotten all about it until a correspondent mentioned it to me a couple of weeks before I left for England. My list of books to read will take years go get through, I guess! Hatchard's soon organised a Thatcher table near the main entrance. When I passed it later the same day after yet another stop outside 22 Arlington Street, I noticed through the door that more books had been added, but I didn't have the time to take another picture. 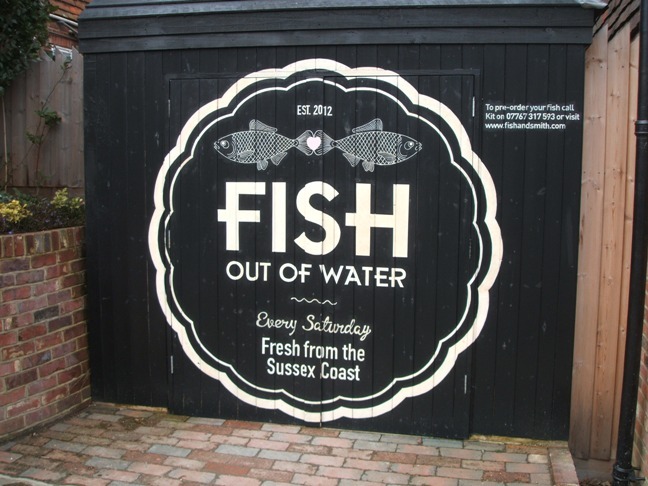 I mentioned earlier that I had lamb liver and bacon for lunch on Friday when I arrived in Ticehurst. My last dinner at this trip was also rather traditional: Steak and kidney pudding at the Hilton London Euston Hotel restaurant. But "as always" I spent the nights at Tavistock Hotel nearby. London is a city I usually visit once a year, if I don't go to Norwich to watch football instead. In London there are certain shops I «have to» drop by. I will not bore the readers with too many details about my shopping rounds, but would like to mention the Twinings tea shop and the Stanley Gibbons stamps shop at the Strand. Yes, I can get hold of Twinings tea everywhere, but there is nothing like buying it in the old shop which Thomas Twining bought as far back as 1706! At Stanley Gibbons I wanted to buy the Sede Vacante stamps issued by the Vatican for the period between Pope Benedict XVI's abdication and Pope Francis' election earlier this year, but it turned out that the shop didn't have them. I have to get them from somewhere else. But they had the Sede Vacante stamps from 1978! 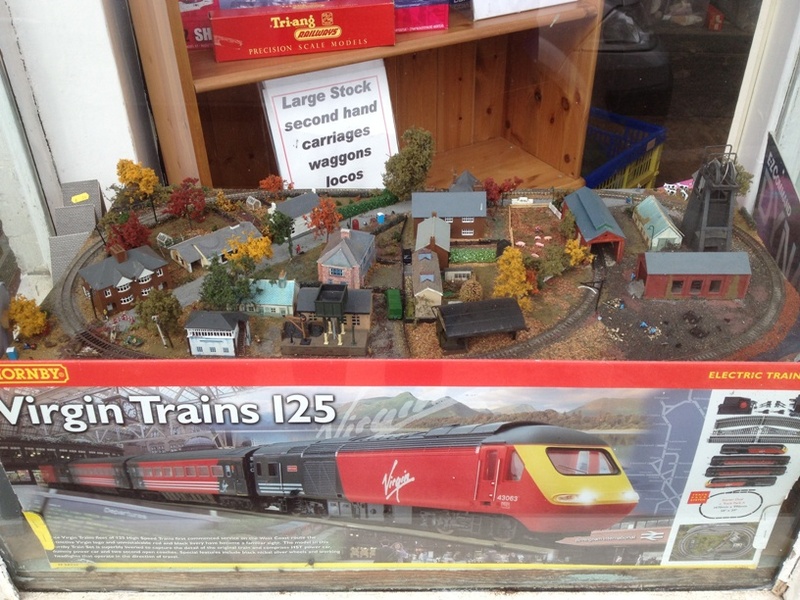 But not 2005, as far as I could tell! I also added some Queen Elizabeth the Queen Mother stamps issued by Tanzania to my collection. After all the shopping on the last trip of my visit (Tuesday 9 April), I found time to visit the British Museum and the exhibition In search of Classical Greece. Travel drawings of Edward Dodwell and Simone Pomardi 1805–1806. Quite interesting! The exhibition closes on 28 April 2013, by the way. I mentioned Norwich, where my favourite football team, Norwich City FC - the Canaries - come from. I visited the city twice last fall, but it still felt strange to go to England without going to a football match. When I attended the Royalty Weekend in 2011, the Canaries met Swansea City away and lost 0-3, but won promotion to the Premier League a month later, and were joined by the Swans. Funnily enough, the same teams played each other during this year's Royalty Weekend as well, now at Carrow Road in Norwich, and the game ended in a draw, 2-2. The Canaries still have a few games left to secure another season in the Premier League. So maybe next time I attend the Royalty Weekend, Norwich will finally beat the Swans? Postscript 23 April 2013: A correspondent has kindly informed me that the soup I had at The Bull, which I thought was spinach soup although it didn't taste like spinach at all, was in fact a green pea soup! It must be added, as said above, that I enjoyed the soup, but just couldn't figure out what it was made of. Now I know! Updated on Wednesday 17 April 2013 at 09:45 (superfluous link deleted), Wednesday 17 April 2013 at 19:40 (minor changes to the Ritz/Thatcher paragraph) and last time on Tuesday 23 April 2013 at 23:30 (postscript added, as well as a word that was missing from the Bul main meal description). The Norwegian Royal Court confirmed this afternoon that Crown Prince Haakon and Crown Princess Mette-Marit are going to attend the swearing in and investiture ceremony for King Willem-Alexander of the Netherlands in Amsterdam on 30 April 2013. The program for the inauguration ceremony can be found at the Dutch Royal Court's official website. The Swedish Royal House will be represented by Crown Prince Victoria and Prince Daniel. I received my copy of the latest issue of Royalty Digest Quarterly during the Royalty Weekend in Ticehurst, East Sussex earlier this month (separate blog article to be published later). The magazine, which is a journal "devoted to the history, genealogy and images of the Royal Families of Europe", has this time selected Grand Duke Friedrich August of Oldenburg with his children Altburg, Nikolaus and Ingeborg for its front page. In his editor's column, Ted Rosvall tells about the King Carl XVI (III) Johan historical seminar, which took place in the Bernadotte Library at the Royal Palace on 25 January 2013. As usual, the magazine's historical consultant, Charlotte Zeepvat, has given more than one contribution. Her first is titled The True Value of Home. The life of Grand Duchess Maria Pavlovna the younger: 1 - Childhood. Zeepvat's second article is titled Oldenburg - A Family Album (hence the front page), which as usual provides a short introduction to the grand ducal house, plenty of images (76 in all) besides the family tables (4 in all). Alberto Penna Rodrigues is the next one out with his article On the Hunt for an Empress, which deals with Emperor Pedro I of Brazil's search for a new wife after the death of Empress Maria Leopoldina, daughter of Emperor Franz I of Austria. The result of his search was Princess Amélia of Leuchtenberg, née de Beauharnais. Wills seem to be the main topic for Edward W. Hanson's RDQ contributions, and in this issue he presents The Last Word of Queen Joséphine of Sweden, nee de Beauharnais, a sister of the above-mentioned Amélia. 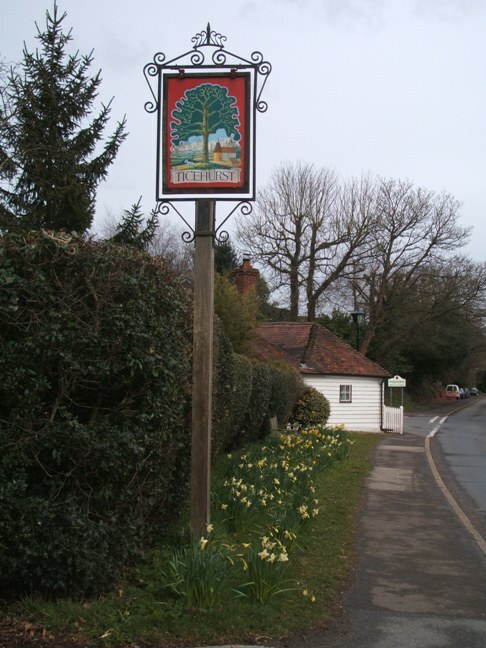 The writer and royal historian Elisabeth Jane Timms has written the article Wolbrook Cottage. The Villa of the Duke of Kent in Sidmouth, Devon. The title doesn't need any more explanation, of course. The villa is today known as The Royal Glen Hotel. On 19 February 2013 Prince Dom Pedro Gastão, Head of the Imperial House of Brazil, would have celebrated his 100th anniversary. This is reflected in the Brazilian historian Victor Villon's article The centenary of Prince Citizen. D. Pedro Gastão de Orelans e Bragança was born a hundred years ago. The Royalty Digest Quarterly has this time both a book presentation column and a book review column. The former deals with the photo book The Princely Family of Liechtenstein by Uve Harder (Van Eck Verlag, 2013), while the latter covers A Royal Christmas by Jeremy Archer (Elliot & Thompson Ltd., London, 2012), reviewed by Charlotte Zeepvat. 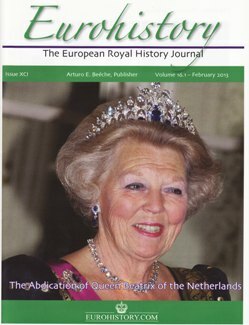 Just like The European Royal History Journal, the RDQ provides an obituary of Margarita of Baden (1932-2013). The author is Robert Golden, who was one of the speakers at the Royalty Weekend earlier this month. Finally there is the traditional World Wide Web of Royalty column, with news of the royal, princely and/or mediatized houses of Baden, Italy, Monaco, Ortenburg, Prussia, Rechberg and Rothenlöwen, Saxony, Reuss, Sweden, Waldburg-Zeil and Bavaria. Updated on Wednesday 17 April 2013 at 00:10 (link added). 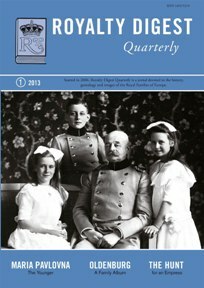 I received the latest issue of The European Royal History Journal (Issue XCI, Vo. 16.1, February 2013) at the Royalty Weekend in Ticehurst, East Sussex (separate blog article to be published later) earlier this month. The front page - in nice green colours (should perhaps have been orange!) shows Queen Beatrix of the Netherlands, who is to abdicate on 30 April 2013 in favour of her son, the Prince of Orange (Prince Willem-Alexander). The latest issue provides many interesting articles. The first one out is the ERHJ regular contributor Ilana D. Miller, known among others for her book The Four Graces (2011). Her article is titled What's In a Photo. A Family Visit to the Court of Tsar Alexander III, and opens with the author's impression that the emperor doesn't look well... The photo was taken at The Cottage Palace in Alexandria Park in 1889, five years before he died. Besides the main photo of the article you may also enjoy 12 more photos of members and relatives of the imperial family. The second article is written by QVD author Marlene Eilers-Koenig, who focuses on the marriage between Archduke Imre of Austria and Kathleen Walker. The wedding took place on 8 September 2012 in Washington, D.C. The article is illustrated by many photos of the guests taken outside the St. Mary Mother of God Church. In the Royal Book Reviews section another ERHJ (and RDQ) regular contributor, Coryne Hall, covers the books The Last Days of Richard III and the Fate of his DNA (by John Ashdown Hill, The History Press, updated paperback edition, 2013) and Twilight of the Romanovs. A Photographic Odyssey Across Imperial Russia (by Phillipp Blom & Veronica Buckley, Thames & Hudson, 2013). In connection with the forthcoming abdication of Queen Beatrix of the Netherlands, Arnout van Cruyningen has been given space to write about the Dutch inauguration ceremony, The "Inhuldiging". The Solemnization of the Dutch Monarch's Accession to the Throne. The author believes that the best English translation for the Dutch word "inhuldiging" ("Huldigung" in German) is "Ceremony of Homage". Then Coryne Hall returns with her article Murder in Marseille - The Assassination of King Alexander of Yugoslavia. Its neighbour country Albania is also given attention in Lucas Szkopinski's article The Reburial of King Zog of the Albankians. Tirana, 17 November 2012. The reburial, which was also one of the topics at the Royalty Weekend, was attended among others by Grand Prince George of Russia, Prince Nikola of Montenegro and Radu Duda (Prince Radu of Romania). Joe Spiteri (not the former Australian football (soccer) player, I presume!) then deliberates about among others changes to the usage of royal titles in his article What's in a Title, while the ERHJ editor and publisherArturo E. Beéche has written the obituary about Princess Margarita of Baden (1932-2013). Finally there is a Royal News section divided into First Section Almanach de Gotha and Mediatized Dynasties. The publisher of The Europan Royal History Royal can be reached at erhj [at] eurohistory.com. The website Eurohistory.com could have been more updated, but on the other hand its blog is updated usually several times a week. The same thing can be said about its Facebook page. 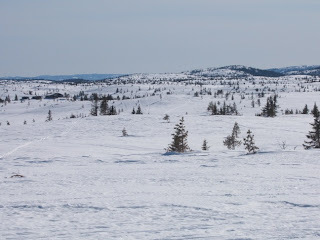 Easter 2013 was spent at Blefjell (a mountain area in Southern Norway on the border between the counties of Telemark and Buskerud). 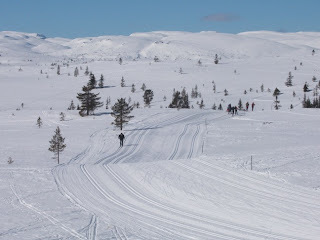 The weather was wonderful and the ski tracks just excellent. Could one ask for more?